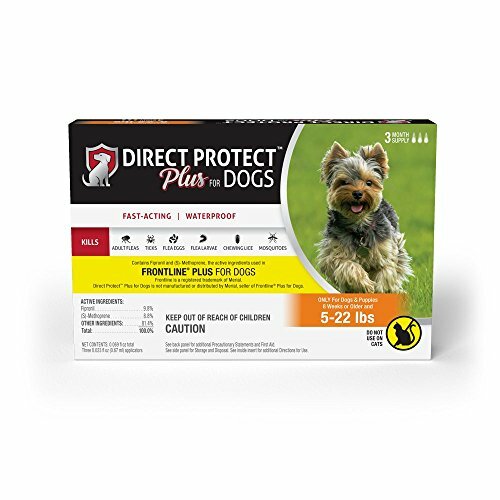 Direct protect plus flea and tick treatment for dogs offers an effective and convenient way to keep your dog protected from pests. This fast-acting topical treatment contains Fipronil and S-Methoprene, the same active ingredients found in the leading national brand. It is effective at killing adult fleas, ticks, chewing lice and mosquitoes, and importantly breaks the flea and tick life cycle by killing flea eggs, flea larvae and pupae before they hatch. Direct protect protects your pets from fleas and ticks for a full 30 days and kills brown dog ticks, American dog ticks, lone star ticks and deer ticks that may carry Lyme disease. Application is easy, just squeeze this spot treatment onto your dog's skin between the shoulder blades. Direct protect works on dogs 8-week and older, and ranging from 5 to 22 pounds; it is long-lasting and waterproof, offering continuous protection even after a bath, a dip in the pool, or after being exposed to rain and weather. If you have any questions about this product by Direct Protect Plus, contact us by completing and submitting the form below. If you are looking for a specif part number, please include it with your message.